Product Range of Big Beard Co. Ltd. This website is designed by Bill Chen of Big Beard Co. Ltd. Copyright 1996-1999. 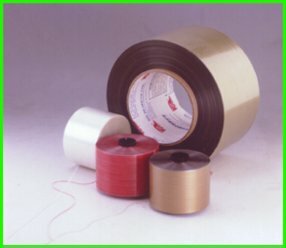 Teartape is a widely used system to open the package of various kinds of products like Cigarette, CD and VCD disk, Audio and Video cassette tape, Chewing gum, Biscuit, Circuit board and also Carton box, Envelope etc., As a world leader in the teartape manufacturing industry, we can supply you with various kinds of teartapes to meet your needs. Width of Teartape 1.6mm, 1.8mm, 2.0mm, 2.5mm, 3.0mm, 4.0mm, 5.0mm, 6.0mm Other widths are available on demand. is specially suitable to use with heat shrinkable wrapping film.